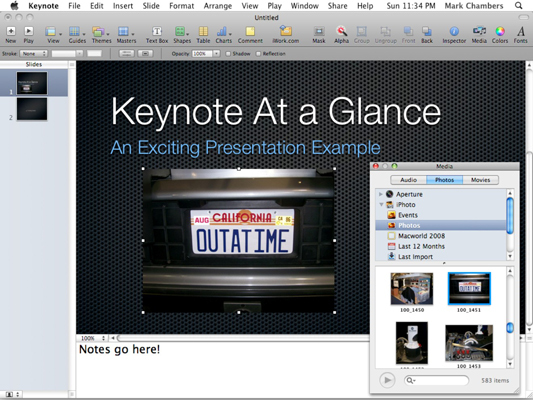 The Keynote application included with Mac OS X Snow Leopard is great for making slide presentations. And adding audio, photos, and movies to a slide is drag-and-drop easy in Keynote. Simply drag an image, audio, or movie file from a Finder window and place it at the spot you want within your document. Click the Media button on the toolbar. Click the Audio, Photos, or Movies button to select the desired type. Keynote displays the contents of your various media collections ¯ like your iPhoto and iTunes libraries. Alternatively, you can also navigate to the file’s location on your hard drive, or type in a filename in the Search box at the bottom of the browser. Drag the file you want to add to the spot you want in the document. It’s not just photos ¯ you can add audio and movie clips to a slide, too!